Motivation refers to recurring factors that influence how an individual interacts with the environment. Motivation has been studied from the behavioral, molecular, and genetic perspectives. While studies on healthy humans have focused on the behavioral side, medical studies on patient populations such as those with ADHD or dementia have observed behavioral, genetic and molecular and physiological differences. Behavioral tests, in the form of interviews and experimental games can be used to measure motivation. It has been suggested that various parts of the brain including the striatum4, hippocampus5and the basal forebrain6may be involved in motivation. A study in rats showed some evidence that the basal forebrain may be involved in reward-seeking behavior. 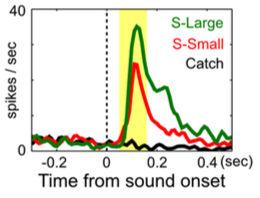 In this study, rats were randomly played various audio stimuli - one of which is associated with large reward (food), one associated with a small reward, and one with no reward (Figure 1). It was found that the rats exhibited larger neuronal spikes in the basal forebrain, in response to the stimuli for large rewards (Figure 2). This experiment suggests that the basal forebrain may play a role in motivational behavior. Rats were given different stimuli each of which was associated with different levels of reward (large, small, or none). The spiking activity of the basal forebrain neurons was measured in response to each stimuli and resulting action. Rats exhibited larger basal forebrain activity spikes in response to the stimuli associated with larger reward. This suggests that the basal forebrain may play a role in motivational behavior. In one study, participants were instructed to perform a puzzle-solving task. In one group, the participants were informed that the task was supposed to measure their normative ability on a high to low scale. In a separate group, the participants were given a more subtle hint that their motivation was being tested -- they were simply told that the task could result in either failure or success. The former group of individuals exhibited greater amounts of intrinsic motivation (measured by the amount of attention the participants paid to the task) compared to the latter group. Often in task-based forms of assessment, participants are observed while performing or before or after performing the task. In order to understand the participants from an unbiased perspective, sometimes the participants are observed without prior explicit knowledge of observation. Measurements such as attention given to the task during waiting periods or "down time", are taken. In the scientific community, motivation has been studied in the context of genetics, behavioral modifications, and diseases and disorders. Genetic studies on motivation involve observation of identical twins, as well as large scale studies involving genomic biomarkers. In addition to aspects of goal-setting, how feedback is given carries influences on motivation. A meta-analysis found that giving positive, competence-confirming feedback was important in increasing intrinsic motivation. In this case, motivation was measured via free-choice persistence, which refers to a tendency to stay attended to a task even when not directed to do so.9Such experiments suggest that people may develop more intrinsic motivation if given feedback that confirms their competence or skills. Motivation levels may change when patients are experiencing a disease or disorder. For example, patients with depression or cognitive impairment may exhibit a decrease in motivation levels. In such cases, treatment of the underlying disease state may help to increase motivation levels. Scarr, S. (1966). Genetic factors in activity motivation. Child Development, 663-673. Deci, E. L., & Ryan, R. M. (1975). Intrinsic motivation. John Wiley & Sons, Inc..
Liljeholm, M., & O’Doherty, J. P. (2012). Contributions of the striatum to learning, motivation, and performance: an associative account. Trends in cognitive sciences, 16(9), 467-475. Tracy, A. L., Jarrard, L. E., & Davidson, T. L. (2001). The hippocampus and motivation revisited: appetite and activity. Behavioural brain research, 127(1), 13-23. Avila, I., & Lin, S. C. (2014). Motivational salience signal in the basal forebrain is coupled with faster and more precise decision speed. PLoS Biol, 12(3), e1001811. Harackiewicz, J. M., & Elliot, A. J. (1993). Achievement goals and intrinsic motivation. Journal of personality and social psychology, 65(5), 904. Rawsthorne, L. J., & Elliot, A. J. (1999). Achievement goals and intrinsic motivation: A meta-analytic review. Personality and Social Psychology Review, 3(4), 326-344. Ryan, R. M., Koestner, R., & Deci, E. L. (1991). Ego-involved persistence: When free-choice behavior is not intrinsically motivated. Motivation and emotion, 15(3), 185-205.